I recently finished Life of Pi by Yann Martel over the summer. I cannot say enough about how beautifully this book is written. The way Martel weaves together creation and religion is mind blowing. The main character, Pi, is a very religious individual. He is Hindu, Christian, and Muslim; three religions that do not get along and have very stark differences. Yet, somehow, they work together in Pi and create a relationship with God unlike any other. There’s a part in the book when Pi’s three religious teachers meet together accidentally and they tell Pi that he must choose one religion. That he cannot serve all three. And Pi says, “I only want to love God.” It really struck something in me. Pi discovered the root of religion…love. Obviously, the path to loving God is completely different for all three religions and, as a Christian, I believe that the only way to love God is to allow Him to cover you in grace and understand that pure love only comes from God and cannot be earned or worked for. Now, I’m certainly not intelligent enough to get into a religious debate, but Pi’s statement allowed me to see the Hindu and Muslim religions in a different light and showed me the common ground we share. I think any time the Lord calls me out on my judgmental mindset is a good thing. The other aspect I loved about this book was the way he spoke about creation, specifically, the animal kingdom. Pi’s parents owned a zoo, so he grew up observing animals his entire life and the way he would connect animal and human nature was amazing. Everything from our shelters to our routines to our personalities. And then, of course, he would connect all of that back to God. I loved the way he mixed science and reasoning with religion. Brilliant! I did see the movie before I read the book which I realize is a huge no-no, but it didn’t matter. The book is just as good after you’ve seen the movie and vice versa. I love it when the movie is good, too! If you haven’t already, read this book. There was so much more I could have said about it. I pretty much drove Michael crazy wanting to read parts out loud to him every 5 seconds. So good! I realize that as an English teacher, I should be reading great classic literature like Beowulf and Ulysses, and I’ve read and sometimes even enjoyed those books, but what I really like is a good young adult fiction novel. Key word good. Meaning not Twilight. Not that Twilight doesn’t have it’s place in the world. I say if it gets a teenager to put down their cell phone and pick up a book, it’ll work. I’ve had some free time this summer to actually do a little reading and I read The Giver series. Yes, that The Giver. The one you probably read in the 8th grade about the 12-year-old boy named Jonas who lives in a world of no color and everything in his life is chosen for him and he feels nothing. Then, he becomes the receiver of memories and starts to feel and experience what it’s like to be free. Remember that book? I LOVED that book. 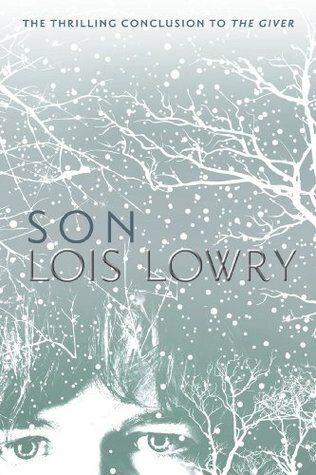 Well, Lois Lowry turned it into a series and it’s excellent. I really like how she connects the characters in all 4 books. The second book, Gathering Blue, is about a young woman who finds she has a special talent for threading pictures that tell the future. She too, like Jonas, lives in a community with a lot of rules and strict codes to live by and her talent enables her to rise above her current situation and find something good in her world. Something she can rely on for the future. The third book, The Messenger, is about a young boy named Matty who lives in a village where anyone who felt oppressed in their former community could find freedom and purpose in this village. Unfortunately, this village is corrupted by evil and the villagers make drastic changes to it that they believe will make it better for the people who live there. He has a special gift as well which comes into play once the villagers’ changes start to corrupt everyone. The last book, Son, was my favorite. It’s about a woman named Claire who had a baby boy. That baby boy is taken from her and she has no idea where he is. The book follows her journey to find her son and be reunited to him. Obviously, I like it because it’s about a mother and her son, but I also liked it because it’s about how human nature can withstand so much, but continue to strive toward what you know belongs to you. Claire never gives up on finding her son and she goes through A LOT. In The Giver and all of the other books in the series, there is a lot of spiritual connections to be made (which I love, of course). The villages themselves being either a place of freedom or a place of condemnation. Evil desires taking over the hearts of good men causing them to do unspeakable things. The weaknesses in others becoming their strengths and what ultimately brings them through any situation. The power of community. People using gifts to help others, sometimes ultimately sacrificing themselves. They are really easy, good books that I would recommend to boys or girls 6th grade and up. Obviously, the older you are, the more you’ll glean from the novels just because of deeper levels of experience, but the stories themselves are highly intriguing. Enough to keep even the most hyperactive kid interested for a little while at least.